The hinge on Clara’s metal lunchbox broke last week. So I’ve had to (a bit nervously) resort to a free soft lunchbox from the “Cloudy with a Chance of Meatballs” movie. A few years ago soft lunchboxes had a big problem with lead, so I still tend to stay away from them. Although, they’re probably safe by now. It would be nice if the Laptop Lunch System came out with a nicely sized square box. 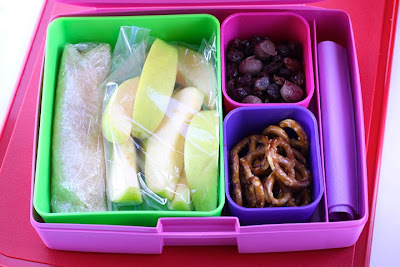 We still use a standard metal lunch box for food thermoses, soups, and other bulky items. Clara’s new metal lunchbox should arrive shortly from Lunchboxes.com. Maybe then I can quietly dispose of that cute green bag when my daughter isn’t looking. Currently, between running around like crazy and pulling my hair out, I’m reading Lunch Lessons, a book by one of my renegade food heroes. Chef Ann Cooper's really changed and influenced school lunches not only in Berkley, but slowly across our nation. Thankfully, her book gives us lunch packers information on cold lunches too. I highly recommend it if you’ve got children in school. Week of May 24th-May 28st 2010. I didn’t keep up on the lunch veggies very well this week. Hopefully, that’s ok this time as we enjoyed lots of spring vegetables in our family meals. On the side- Snack bag with two homemade flour tortillas rolled up around cheese sticks. So the life expectancy of a bento box is approximately one school year? I wish you'd make me lunch every day! Did you find the pizza I hid in your kitchen yet? Ah more great great lunch ideas! You are one great mom.